Sir Francis Bacon rightly said, “Some books are to be tasted, others to be swallowed, and some few to be chewed and digested”. The Library being a part of the curriculum has become an important tool in the propagation of academic advancement. 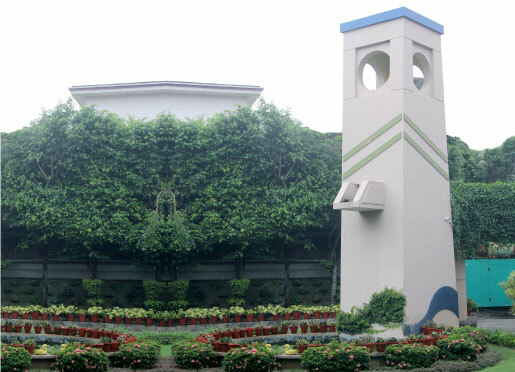 K. L. International School Library has four libraries stocked with ample reference material to inculcate love for reading. Our librarians and teachers encourage the children to choose books according to their taste. What cannot be completed in school can be at home. We find that our children are improving not only in the subject matter chosen for reading, but also in language, expression, vocabulary and fluency. KG Library comprises of puzzle books, language books, interactive flash cards, comprehensive curriculum of base scales, three dimensional books on rhyming words, numbers, alphabets, opposites etc. Classes I & II Library stocks fairy tales, fables, plays, and many more fiction books of great writers like Sally & Sam, Enid Blyton, James H. Fassel, John Gatehouse, etc. Classes III to V Library stores books on fairy tales, short stories, fables, academic coverage, general knowledge, art & craft, etc. Classes VI to VIII Library stocks books on quizzing, Science & Technology, books on English Fiction, Art & Craft, History books, Encyclopaedia and many other reference books. Classes IX to XII Library stores books on English Fiction, Hindi Fiction, Science & Technology, Art & Craft, History books, Sample papers for the preparation of board exams, Encyclopaedias and many other reference books besides the syllabus books. From time to time books are added to our pre-existing voluminous stock. We also have a magazine section where sports magazines and popular magazines like India Today, Reader’s Digest, Outlook and The Week are supplied. 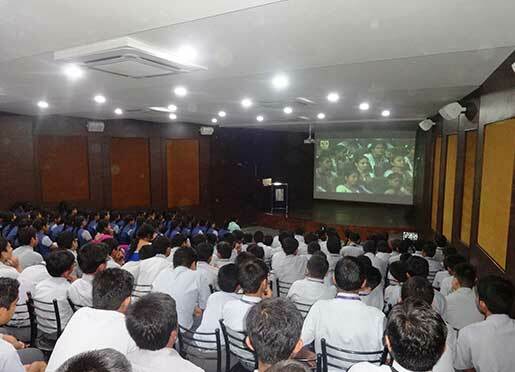 The school auditorium is centrally AC, well equipped with an advance projector, sound and light system. The seating capacity of the Auditorium is around 300, which is sufficient to provide ample opportunities for students to showcase their talents through various activities like Dramatics, Debates, Declamations, Quiz Competitions, Music Competitions. Every month a selected movie is shown to the students of Kindergarten in the Auditorium. The hall is also used to host Seminars, Conferences, Meetings & Parent Orientation. Dance is a non verbal communication which involves rhythm, expression & social interaction, generally presented in a spiritual or performance setting. The school through its well trained and experienced dance faculty offers training to the students for various dance forms like, disco, tango, hip-hop, ballet and ball room dancing, kathak etc. The dance rooms are beautifully furnished and equipped with latest music systems and recording systems that ensures to maintain a good quality of training imparted to the students. 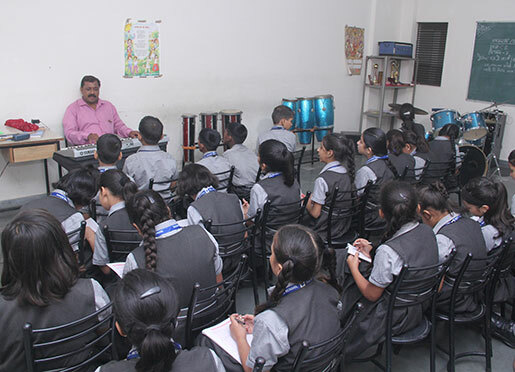 In addition to the school curriculum, individual music classes on a variety of instruments are given by a group of qualified music teachers who take Students are encouraged to participate whenever the occasion arises. Participation gives a wonderful opportunity to learn music with their friends, to learn, to play in a group situation and to extend their appreciation of music. They are great motivators and are probably the main reason for the strength of instrumental music at our school. Our little ones, the bundles of energy, possess an activity room, THE TINY TOTS paradise, with the latest toys and accessories according to the children's likings. Our little ones get to show their creativity through role play in the leisure time in this room. Transport is an integral part of our organization and we have always strived to give the best to the students availing the transport facility. The school provides a fleet of new and very comfortable buses for the neighbouring area. 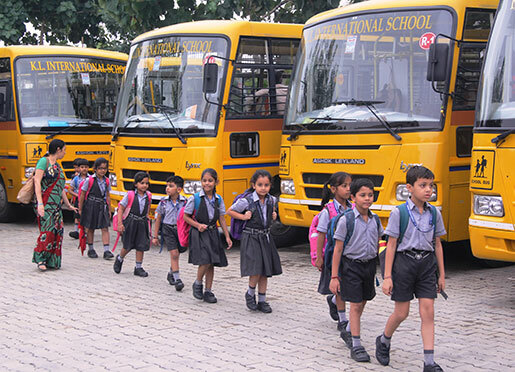 All safety measures are taken care of for the students availing the school transport. Each bus is equipped with first aid box and fire extinguisher. 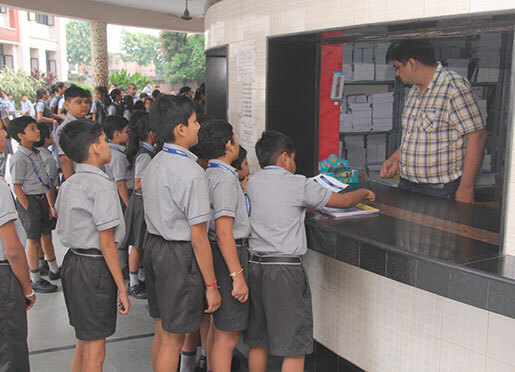 School maintains constant communication with the teacher and the guard on duty to ensure security. Rain water harvesting involves accumulation and storage of rain water for reuse. It ensures independent water supply during water restrictions. The school encourages the rain water harvesting and acknowledges the efforts of those contributing to it by implanting a rain water harvesting system at its own premises. 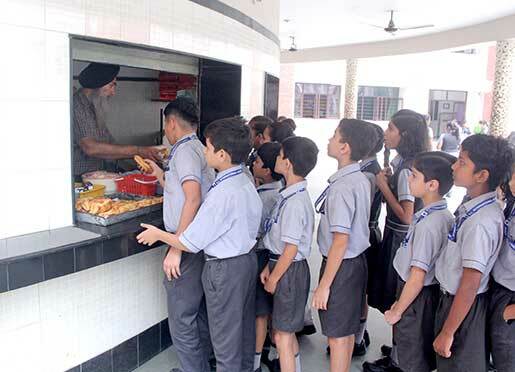 Keeping in mind the physical well-being, health and need of the children, the school has a well-designed and fully furnished canteen which serves quality packed snacks and eatables keeping in mind the nutritive value. To add to the privileges for parents & students, the school has a book shop within the campus to facilitate students for purchasing the prescribed books. It remains open on all working days of the school. The Art Room is provided with sufficient facilities to enable and assist students to learn and show their creativity in different fields of Fine Arts, like Sketching, Drawing & Painting at Junior Level, Middle Level and Senior Level. Painting with oil colours, water colours and acrylic colours. Sculpture of clay & Plaster of Paris etc. Models with different materials like thermocol, hardboard, glass & wood, string etc. Fabric Painting, Batic, Tie & Dye and Still Art. The school houses a well-equipped medical room accessible during school hours. 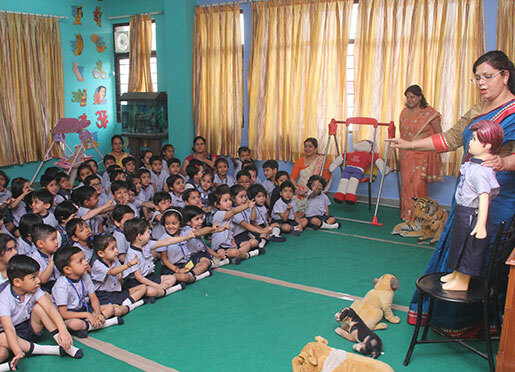 School has a tie up with the skilled professionals to attend all emergencies with utmost care and attention. Two full - time staff nurses are present in school keeping in readiness, emergency medicines and medical apparatus. Regular medical checkups and eye checkups are done once / twice a year (if needed) and proper medical records of students are maintained, coupled with valuable suggestions. Students are mentored on the various aspects of diseases (Health education), first aid, life style and stress management (aided with yoga & meditation). The importance of immunization is highlighted. The added feature of having a part time child counselor helps to eradicate the stress related problems. 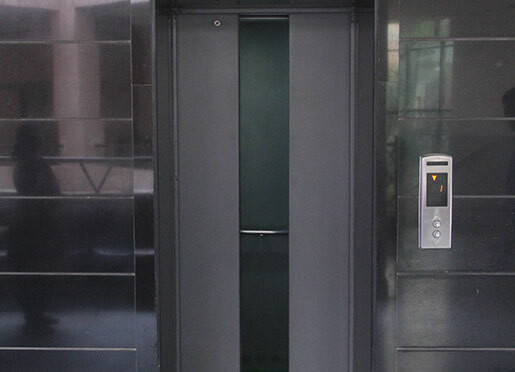 The school has two automatic OTIS lifts with all the latest safety features, having a carrying capacity of 8 persons. This facility is proving to be of great help to parents, teachers as well as children with special needs and indisposed ones. Through Yoga and aerobic exercises the school provides significant health benefits and increased concentration. The expert yoga and aerobic instructors make these practices very interesting.